During the Slurpee and 7-Eleven Battle of the Bands earlier this year, we explored how BOTB contests impact the live music experience for bands and fans. 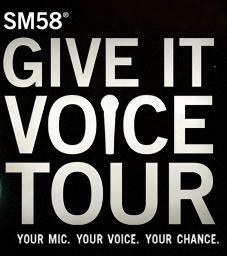 And now we’re going to take a look at two more BOTB contests presented by Shure SM58 Microphones and Jansport. We’ve been following Jansport’s secret Bonfire shows and Unzipped live compilation kick-off, and this week they announced their 2010 Battle of the Bands competition that features 50 hand-picked bands to compete for the chance to play the Sonicbids Official 2011 SXSW party in Austin, TX. After the first round of voting closes on December 20, the top 10 vote-getters will become finalists, but only one band will be selected to become the JanSport Battle of the Bands Grand Prize Winner to be announced in late January 2011. Here’s the details on the contest, then we’ll tell you about Shure’s BOTB competition. For starters I really like how the design and layout of Shure’s Give It Voice Tour captures the vibe of the live concert experience. And I also like the way Shure has partnered with Bandcamp for entry and voting stage, and set up the contest in a Regional tiered structure with free performances taking place at popular music venues in each city. Presenting it as a competitive tour, also reminds me of Red Bull’s recent Rock the Route band competition. As a fan of Chicago’s live music scene it’s great to see the Metro, as the featured location for the Chicago event in January. Comparing these BOTB competitions it looks like they both give bands a great opportunity to promote their music and increase their fan base. Even though Shure’s and Jansport BOTB competitions differ in how they’re structured, it’s still interesting that both Grand Prizes involve the winning bands earning a cash prize and products, and the chance to play on the big SXSW stage in Austin in March. We’ll see how it all turns out as the action unfolds. That said, it’s exciting to see St. Bagu in the running for the Shure BOTB since we’ve featured their trip to Shanghai and their very first live performance before on Live Fix. You can vote for them here. As always, we’ll keep an eye on both BOTB competitions to see how they develop, which bands rise to the top and how the fans interact along the way. If you’re in a band who’s entered, or a fan who’s voted, we’d like to hear about your experience and what you think of either BOTB competition. Do House Concerts Make Live Music More Personal? Dang Chris thank you so much for linking us in the battle! We would love to get picked to rock this!